Location: Spiral Horn Safaris is situated in the Limpopo Province of South Africa with more than 100000 acres of prime hunting land bordering Botswana. About your host at Spiral Horn Safaris: Louis Van Bergen, Owner and Outfitter. Being a very avid bow hunter himself Louis understands the needs of bow hunting clients perfectly and does everything possible to ensure their success in taking great trophy animals. Louis has experience in hunting the big five. The hunting of Lion, Leopard, Buffalo and Hippo became a way of life in Zambia where he spent 2008. Louis returned to hunt South Africa and continues to pursue the Dangerous Game of Africa. 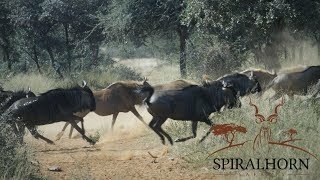 ­­­­­­Hunting experience at Spiral Horn Safaris: Spiral Horn Safaris specialize in the hunting of both plains game and dangerous game in Africa. Louis van Bergen is an avid bow hunter himself and knows what it takes to harvest your dream African trophy. With 12 well equipped blinds on a hunting area of over 100 000 acres we do everything possible to ensure your hunting success. Dangerous game is hunted in a walk and stalk manner with fully qualified Big Five (elephant, lion, leopard, rhinoceros and buffalo) licensed Professional Hunters there as we realize there is no substitute for having an experienced guide, on your dangerous game hunt with bow. At Spiral Horn Safaris we truly do enjoy having families with us on safari, it has become a true passion for us knowing that the future of our industry as well as the future of hunting as a whole depends on our young hunters. We do everything possible to ensure a good healthy hunting atmosphere with special focus being on our young hunters. Click here for quick link country guide. What are the fishing/hunting seasons in Kgatleng, South africa? To select and book the top suggested hotels and accommodation in the area when hunting at Spiral Horn Safaris, click here. by car or public transport to Spiral Horn Safaris.